The last of his bedroom is finally complete. I've been holding onto these 4x4 images from Wendy Bretz for a while and finally got them into the Ikea frames and up on the wall. 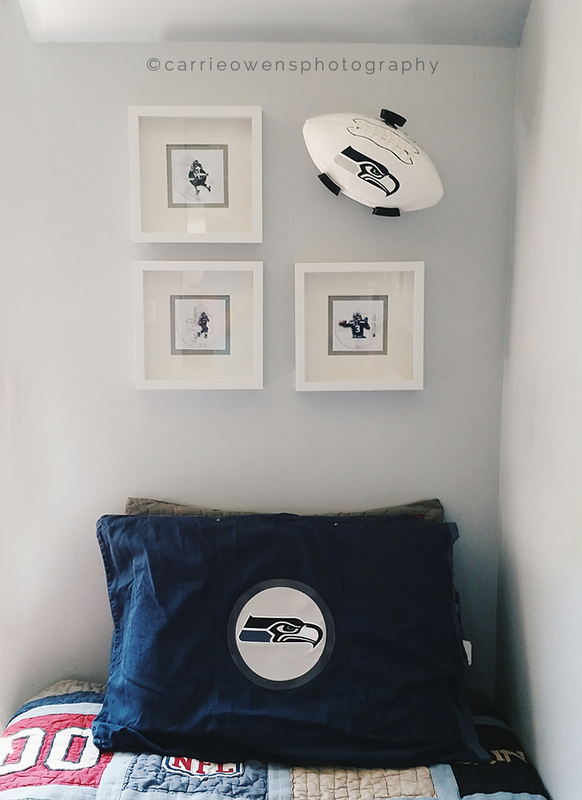 It's been just over a year since we finished my son's Seahawks bedroom. We added in these last few items and now we can say that it's officially complete. 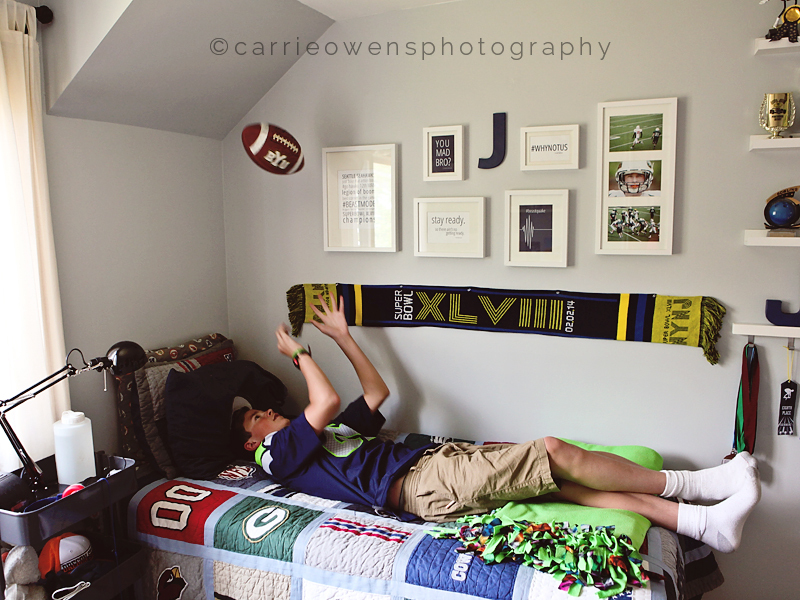 To view the fist post about this room, see this post about his teenage boy bedroom reveal on the Carrie Owens Photography blog. 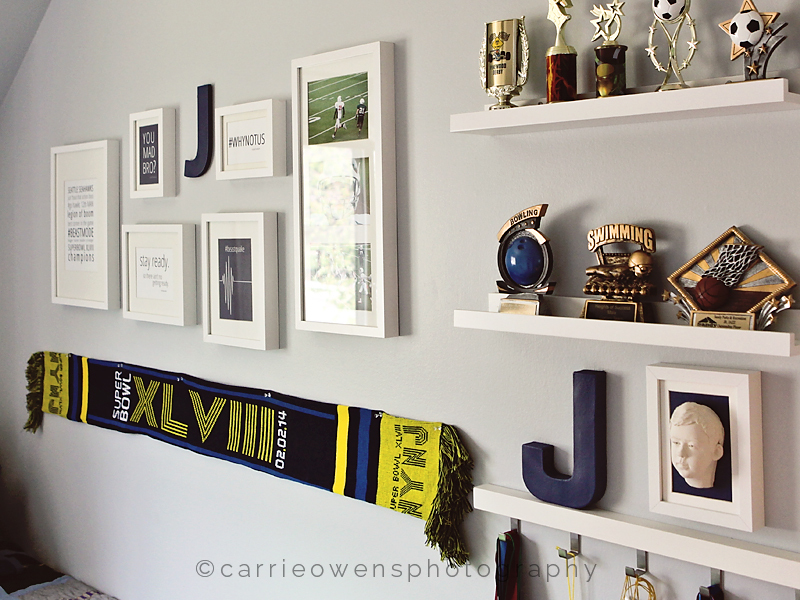 Thank you for stopping by, I hope you love this room reveal as much as my son does! 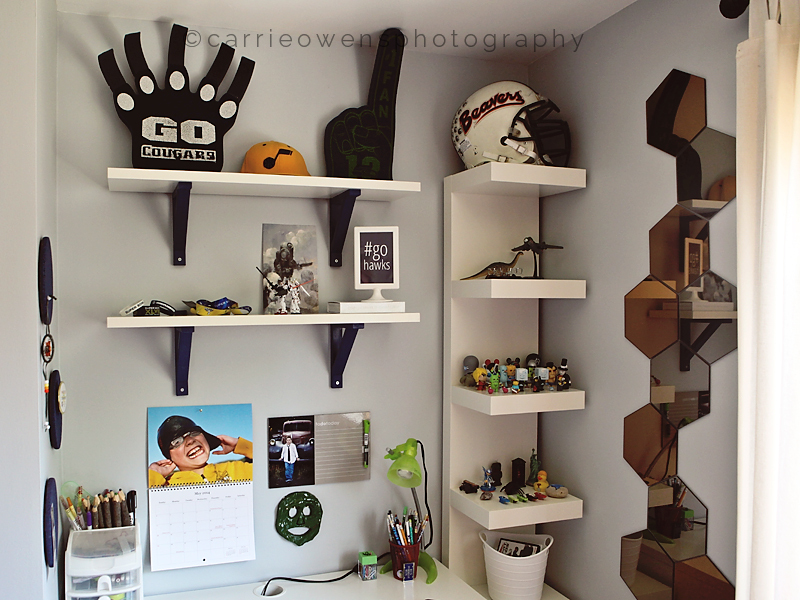 If you want to get some information on how to begin your own teenage boy room redesign, check out my post on Finding Teen Boy Bedroom Inspiration. 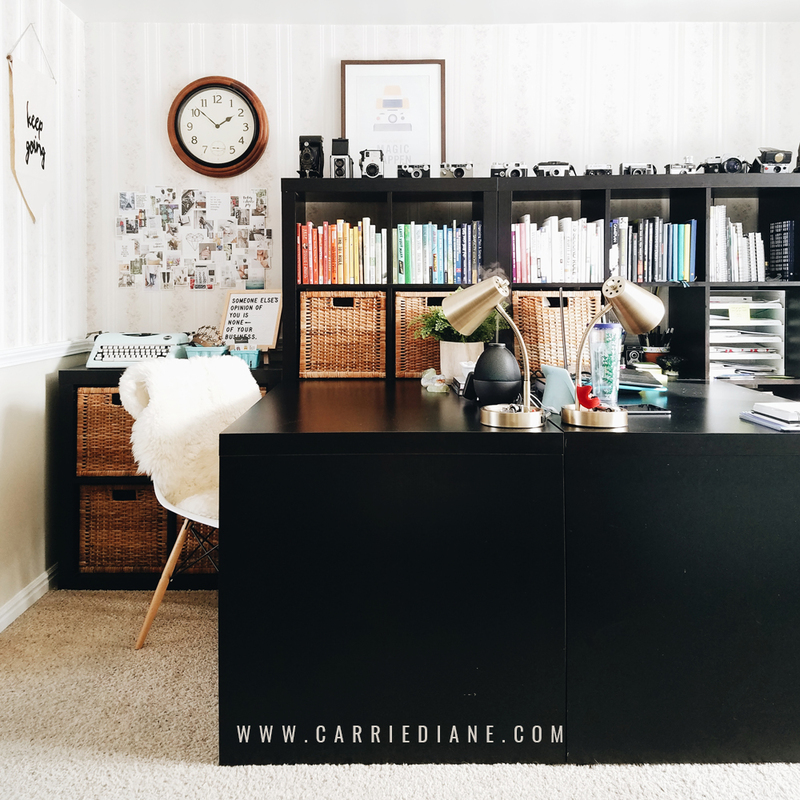 With just a few more finishing touches to add to my oldest son's room I wanted to talk about how we got to where we are now and to give my thoughts on coming up with a plan for a teen boy's bedroom redesign that will get them through those teenage years. 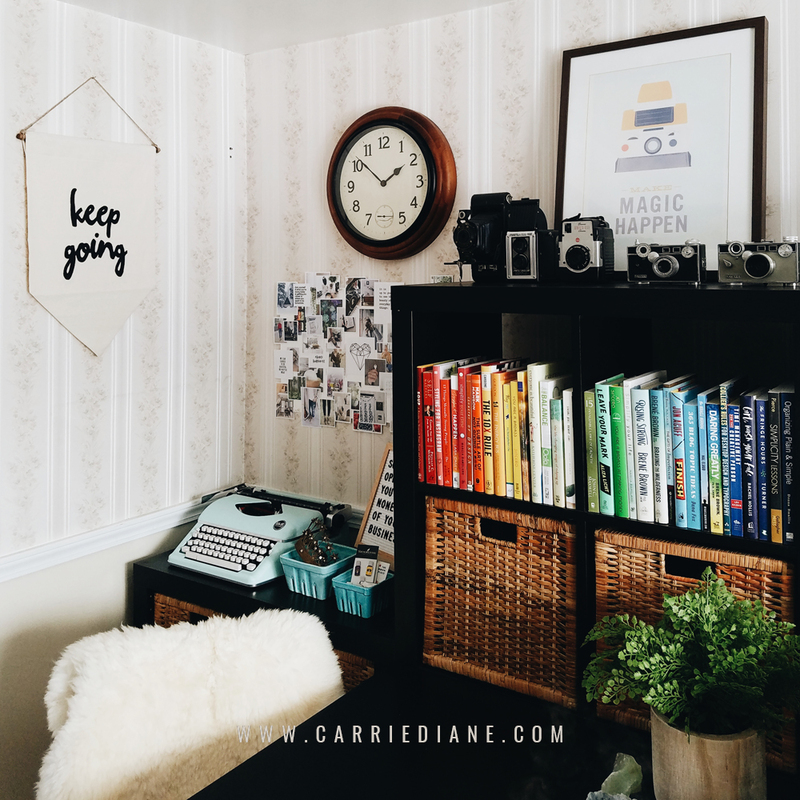 Last May I wrote a post about how we went about getting a plan together for my son's room redesign and our process and you can see that post here: Teen Boy Bedroom Inspiration. 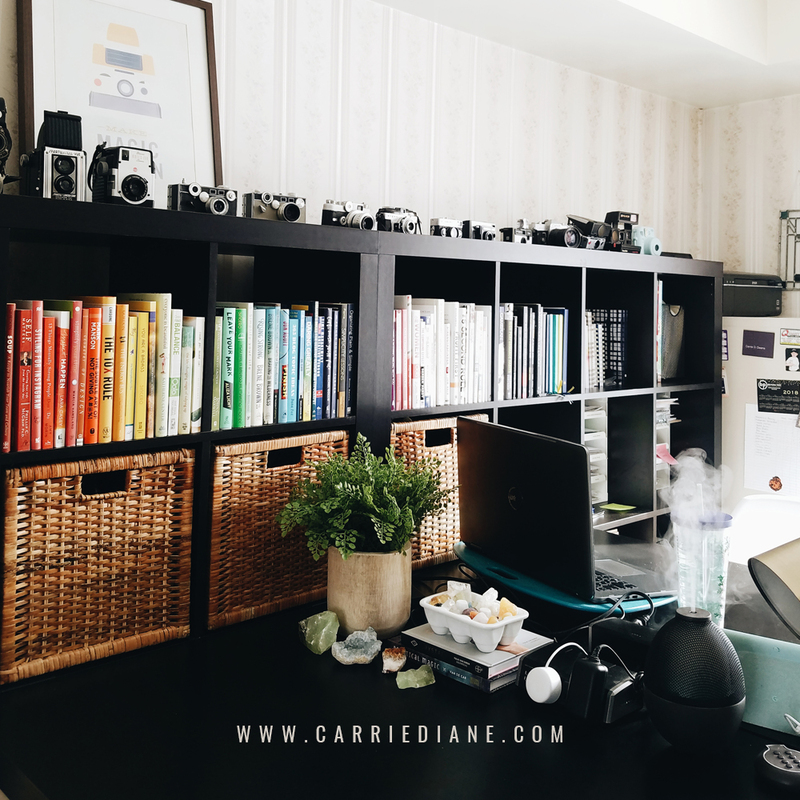 Today I want to talk a bit about putting a plan together for your teenage son's room redesign and the 5 pieces to take to make sure your design works for the long haul. And for all of those kid things that you might need a new home for? Use our trick of getting each kid a color coded large bin for items from their past that they love but don't want or need daily. We store those bins in the basement and out of the kid areas. 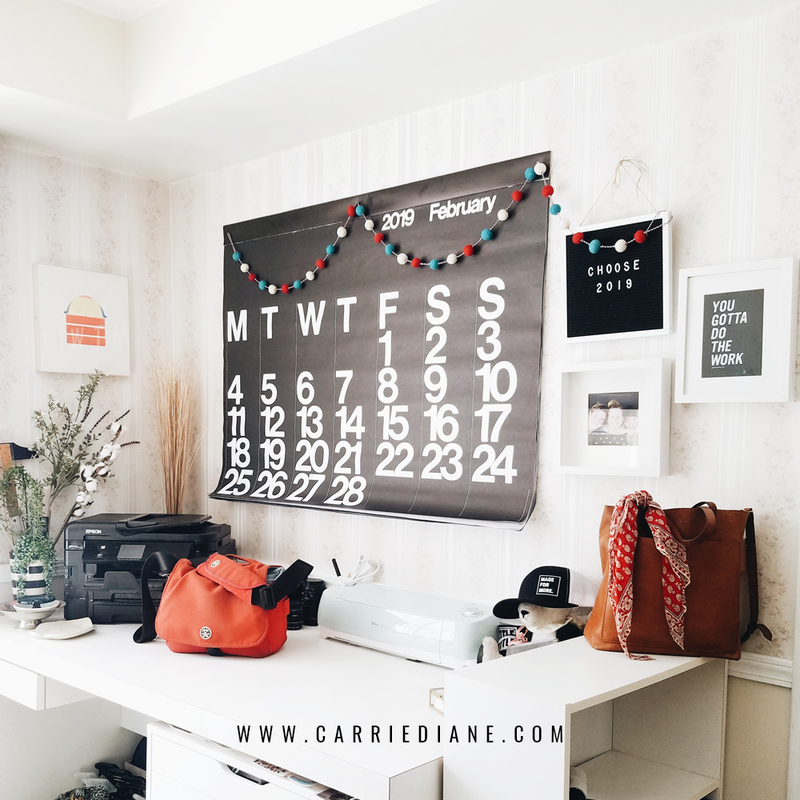 I'm always asking my kids...what can we do in your room to make your life easier? What would make keeping your room clean easier? What would make mornings easier? What would make falling asleep easier? What kind of bed does your son need? My son is tall and when he moved into this room, we knew the bunk bed he had been using needed to go to his little brother. He's still too tall for his twin bed, but he makes it work. What about bedding and pillows? Do you have enough blankets to keep him warm as well as a storage solution for extra blankets for when it's too hot? How about a bedside table for an alarm clock, light and any other important items? How are you going to store the clothes? What about dirty clothes? Hang up clothes and folded clothes need easy access so that your son can easily put his things away...have a kid who constantly misses the dirty clothes? Ask them what would make things easier for them and make them a part of finding a solution. For every item of furniture that we brought into my son's room, we made sure that it had a storage function as well...he is a kid who likes to keep things, and because I knew that going in we were able to find storage pieces to help conceal some of the "stuff". 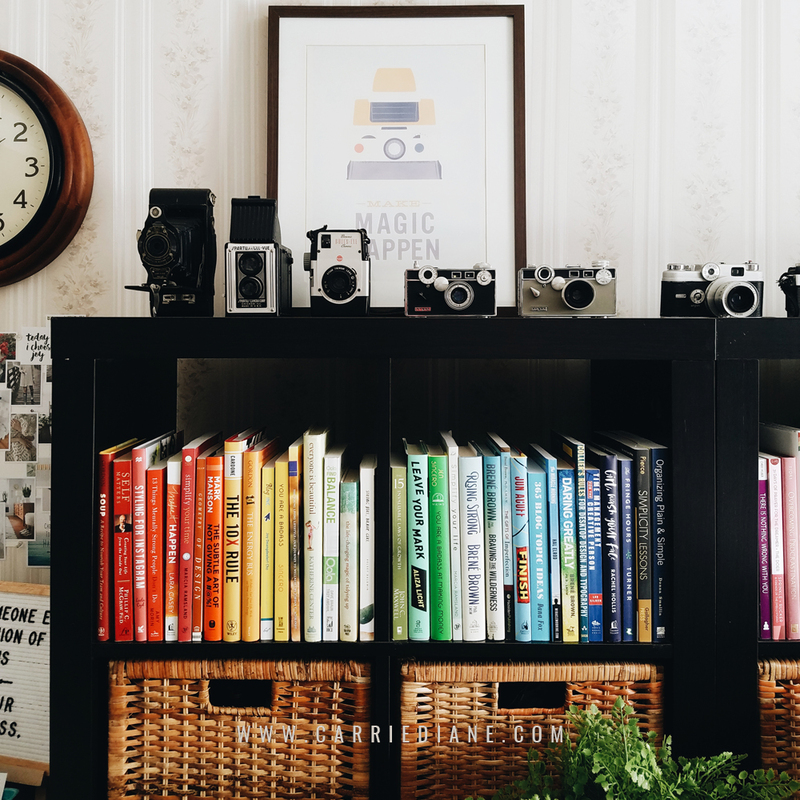 There are bookshelves and storage shelves and cubbies for him to organize his treasures. Does your son study and do homework in his room? Do you need to accommodate a computer? What about chargers and other devices? There are some great items out there that can charge several devices at once and some great cord management items, a quick google search or trip to your local Target or Ikea will give you lots of ideas. Does your son love art and have a need for the storage and/or display of these items? What does your son love? This room is his room that he will remember when he's grown and that will be his sanctuary as a teen. You want it to be a place that he loves enough to want to keep clean and the he feels comfortable in. Is he a music lover? 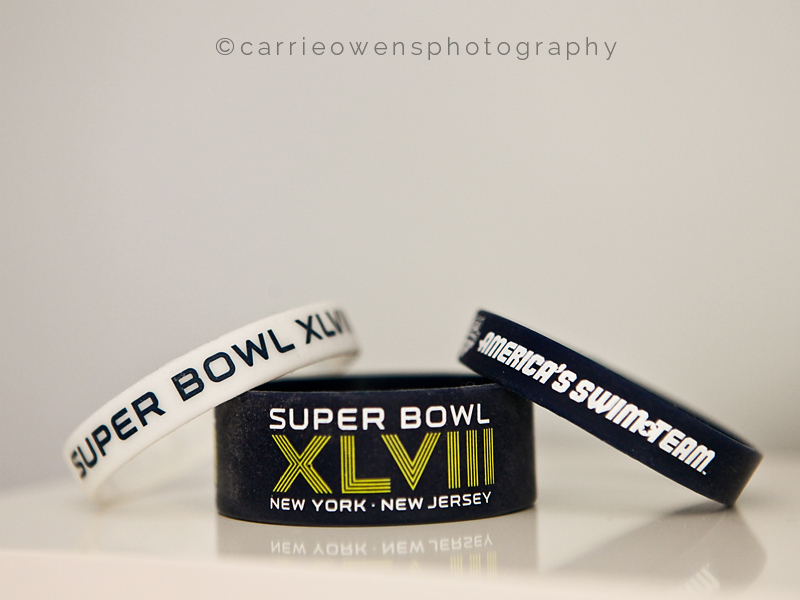 A sports lover? 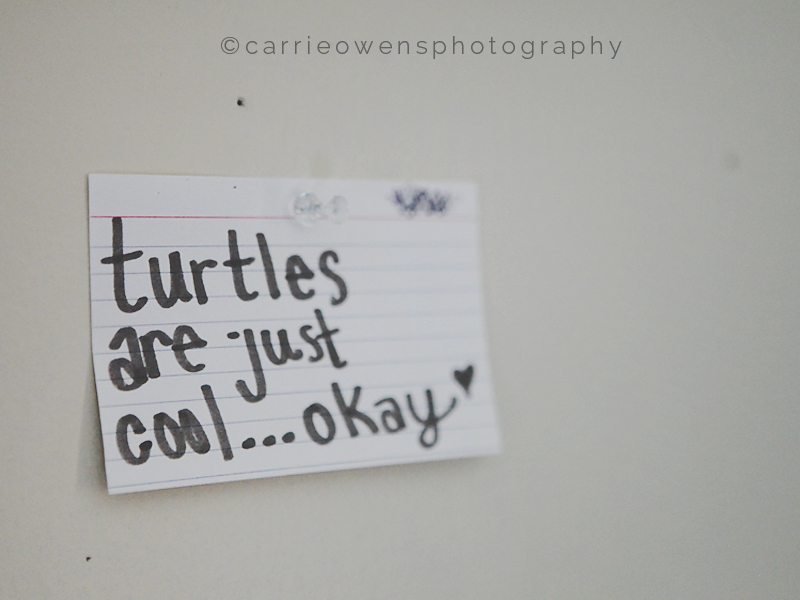 What about comic books or super heroes? What can you incorporate into his room to really let his personality shine through? Think about shelving, art, trophies, posters, etc. The finishing touches are things like the color scheme of the room and how you tie all of the little pieces from the above parts together. What color paint? What about the furniture...all wood, the white Ikea look, metal or industrial? What about window treatments? Flooring and lighting? Make sure that you have the right amount of lighting in your son's room for general overall lighting all the way to task lighting for desk and bedside needs. 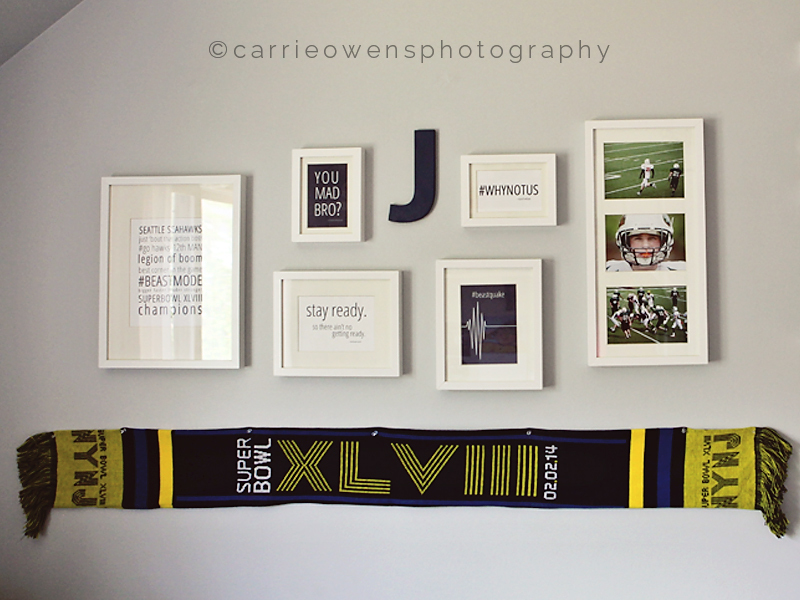 Follow Carrie Owens's board ideas for teen boy bedrooms on Pinterest. 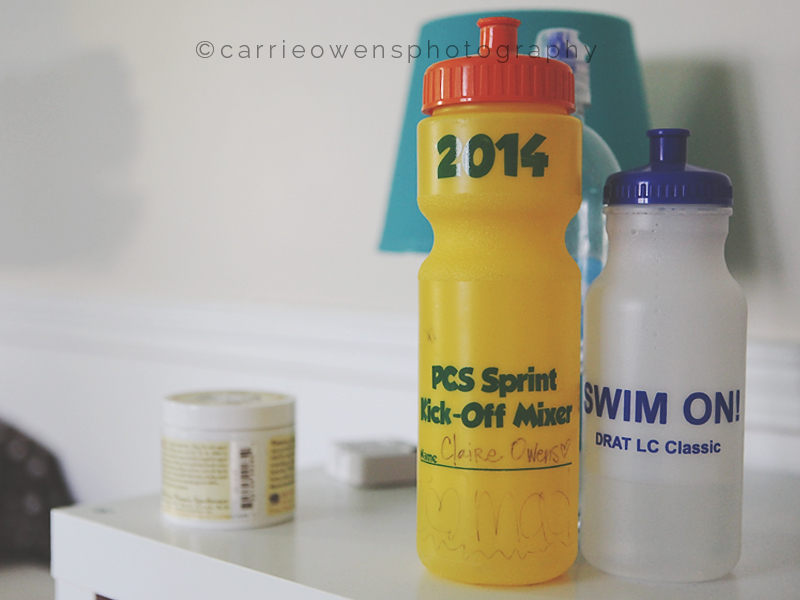 Why am I revisiting my son's room just one year later? 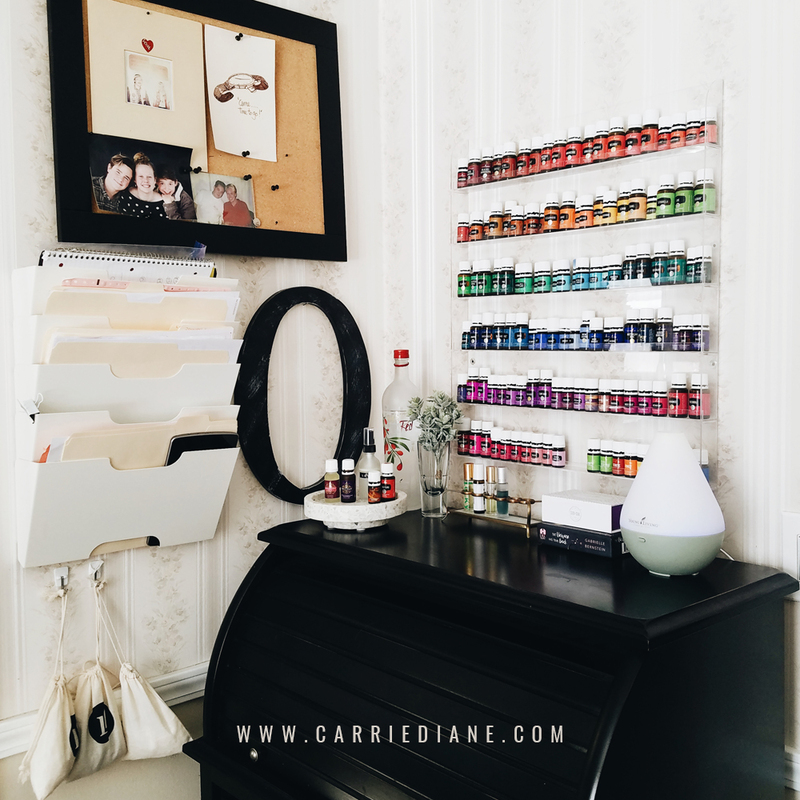 The main reason is that I have finally put the last of the finishing touches up and after a year in his space, we needed to look around and really make sure that the space was working for him. Was he having trouble keeping it clean? Was that because of something more than just being 14? Were we missing a key element that would make his life easier? Check back next week for a post with the finished room and links to sources. Once upon a time there was a glass base lamp that I loved at IKEA. I owned that lamp for maybe a month and then...boys. Kids were playing ball or throwing pillows and crash, that lamp died. I was so sad, but knew that I had kind of been pushing my luck anyway. So it was replaced with a similar lamp that wasn't quite as pretty but was more sensible for the space. And then, while at Target with my mom recently we spotted the most beautiful glass base lamp. Perfect for between the two chairs in my front room that were my grandmother's that I just can't seem to replace. Giving the room just the right amount of light and a little bit of sparkle from the glass. I'm in love again. No playing ball in the house, please. 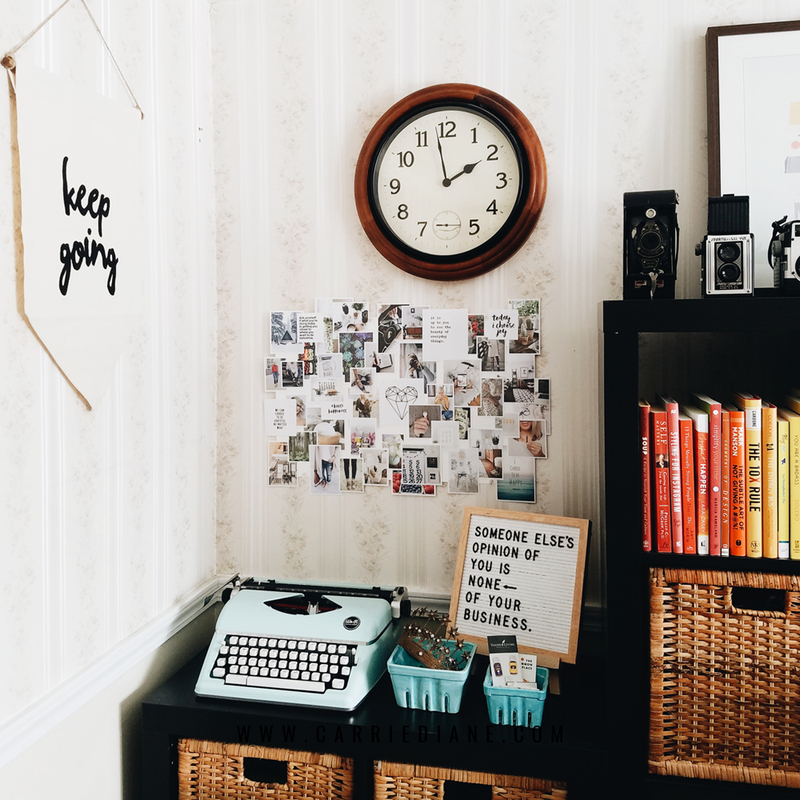 Do you have a favorite little spot in your house that makes you happy when you walk by? 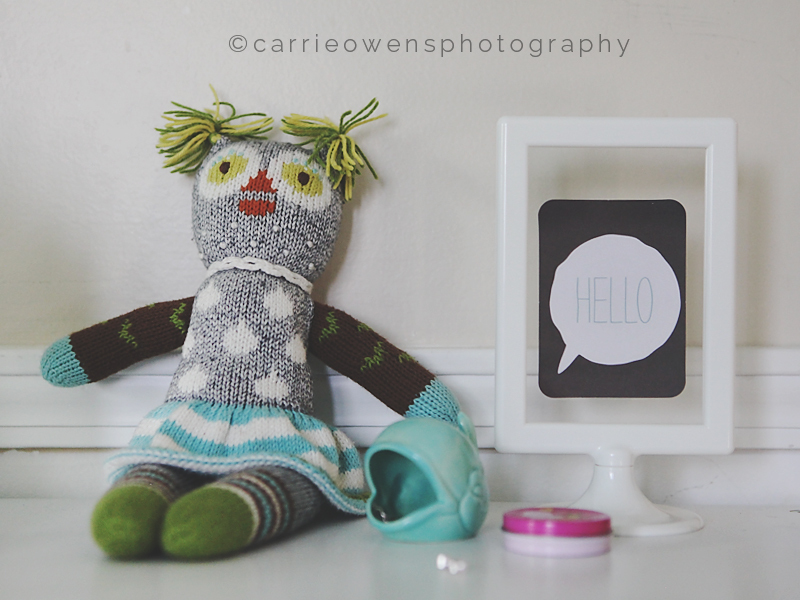 Take a moment this week to look closely at the spaces in your home that make you smile. Grab your camera or your phone and snap a photo. Tastes change, kids break lamps, and time moves quickly. While taking photos of the people that we love is important, it's also so important to document our environment. I love looking back on images from my childhood to see the items in the background and I imagine that your children and you will, too.